The International Air Transport Association, the global industry group, has cut its 2011 profit forecast for the industry in half, and fares are on the rise. The IATA said it "further downgraded its 2011 airline industry profit forecast to $4 billion. This would be a 54% fall compared with the $8.6 billion profit forecast in March and a 78% drop compared with the $18 billion net profit (revised from $16 billion) recorded in 2010." The IATA blamed the troubles in Japan, North Africa, and the Middle East for traffic drops and high oil prices for margin compression. The group also said that higher ticket prices meant to offset fuel costs have driven down leisure travel by 3% to 4% in the last five months. Airlines must now determine which is the lesser of two evils. They can keep ticket prices in check and hope to keep a large portion of their passengers, or they can raise ticket prices to offset higher costs. If carriers chooses higher prices, they risk alienating a certain number of travelers, with the effect being fewer and fewer ticket sales. U.S. carriers have already begun an aggressive round of ticket price increases. Fees for incidentals like baggage have doubled since 2008. There is little reason to believe that airlines will try to use lower fares to lure additional travelers. They simply can't afford it. The industry has a decades-long history of huge losses and occasional bankruptcies. Today's fuel costs alone could push some airlines into the red. Many of these carriers are burdened with huge debt loads which make strong profit margins essential. For example, American Airlines (AMR) has long-term debt of over $10 billion. The summer travel season has just begun. West Texas crude still trades around $100. 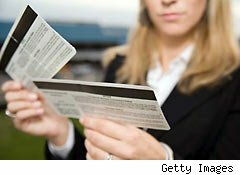 Airlines can't afford to bring down prices to attract new travelers -- and they may have to charge even more for tickets and extras like checked baggage. It is going to be expensive to travel by air between now and Labor Day.